If you have any questions or want to enquire about dates, use our form to contact Dorothy McGuire or see their website for more information. 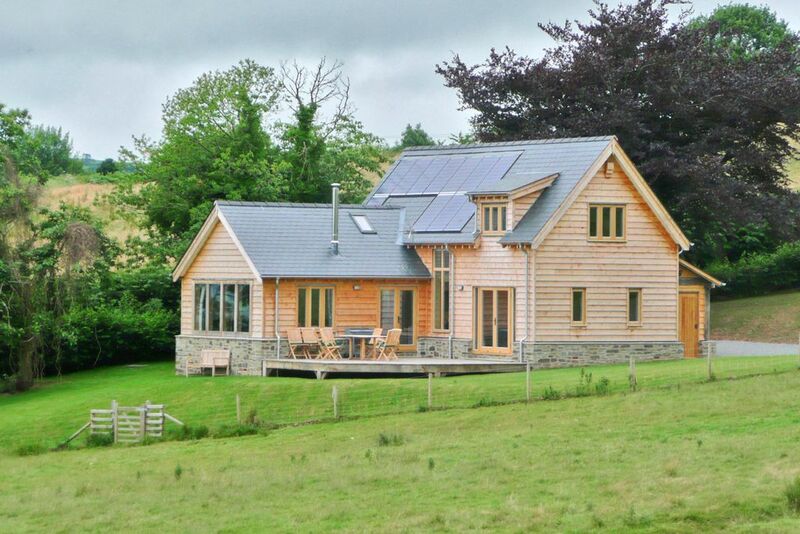 Up, up the track to a brand-new home clad in Herefordshire cedar, fronted by a decked terrace and an astonishing view. Presteigne lies below, the Malverns stretch beyond, and Dorothy and Peter live up the hill. A lot of love has gone into this unself-consciously sustainable, off-grid home, with solar panels on the roof, a bat box in the eaves, triple-glazed windows, filtered spring water and a foolproof Danish stove (logs on the house!). Comfort and cosiness abound and the overall feel is eclectic and colourful, with a hand-crafted oak frame dominating the scene. Giant Indian ‘Hani’ lights hang from the vaulted ceiling, double doors open to the decking, rugs and mats soften the slate floors, comfy sofas face the hills. In the fridge are all sorts of treats; you could barbecue on the deck or stride down the hill to the pubs in Presteigne. Downstairs are a shower room and one bedroom, and the rest are upstairs. Duvets are goosedown, mattresses are new, fun touches include oak pegs for coathangers. But the biggest surprise is the fairytale children’s room, with its blue-painted shutters and Norwegian cupboard beds – kid heaven. Minimum stay: 3 nights at weekends, 4 nights on weekdays, 7 nights in high season. Children over 5 welcome. Short breaks available. A wonderful long weekend in this beautifully appointed cottage. The owners have thought of everything to make a stay comfortable and homely. The interior is high spec and the underfloor heating and woodburning stove made the cottage very cosy. Peaceful surroundings, views to linger over and helpful owners made our weekend memorable. Beautiful views, well equipped and a truly unique property. You could easily spend the week admiring the views out of the oak framed windows, the rolling hills, birds of prey and the glorious autumnal colours. The house itself is worth a mention, the craftsmanship and thought that has gone into making this a great place to be makes for a very relaxing stay, couple this with the fact that you are 100% off grid proves you can have both luxury and sustainability. The area is good for walking and cycling or just taking a drive to one of the many surrounding towns, Ludlow a particular favourite. A wonderful weekend spent at this very special cottage. Luxurious and yet practical, they have thought of everything. The perfect retreat for a family, our kids loved it. We would definitely recommend this cottage and we will definitely be back. Thank you. The Parks cottage is a really interesting and wonderful place to stay. the house its self is well set up with everything you need and its location close to Presteign means you can walk down the hill to one of the friendly cafes in town. What i loved best was lying in bed, looking out at the huge view (complete with red kites soaring overhead and wild deer in the fields!) and then up at the beautifully constructed oak frame of the cottage with its natural curves and hand made pegs holding it all together. A really special place, thank you. What an absolutely lovely place. So much care and thought has gone into building, decorating, furnishing and equipping. Great location for walking, relaxing and exploring. We were a mini reunion of 6 friends, there for a long week-end of walking and talking and it was just perfect. We all agreed that we could have spent at least a week here and still not have done half of what there is to do in this breath taking area. We are hoping that we will be able to organize another visit. The delightful hosts who live up the hill, couldn't have been more helpful or generous. Thank you. Very well situated for walkers, the Parks cottage is close to Offa's Dyke track and only a short drive from the Offa's Dyke centre in Knighton. This is a wonderful landscape for short or long walks; perfect with a dog. Cycling too. The border town of Presteigne is a 5 minute drive or 30 minute walk away, nestled in the valley below. It has a wealth of interesting shops and cafes, as well as The Judge's Lodging, a fine local history museum. Quality local produce is available. For garden lovers, there is no shortage; Bryan's Ground is close by, Hergest Croft, Westonbury Mill water gardens, The Whimble Nursery and gardens to name but a few. There are many local National Garden Scheme open days through the year. We are close to a number of good pubs and restaurants: The Ducks Nest in Presteigne, Riverside Inn in Aymestry, The Red Lion in Knighton, the Tram Inn in Eardisely. Presteigne has a burgeoning number of cafes and several pubs. The Book and Philosophy Festivals at Hay-on-Wye are within easy reach. Presteigne Festival, the Ludlow Food Festival, the VSCC Welsh Trial, and a vibrant music scene in Presteigne are all reasons for staying here. The property is off grid, with electricity and water supply linked to the owners house up the hill. Step across the lane and you are out of Herefordshire and in Wales!